Mr Ram Bilas Paswan, President, Lok Janshakti Party, has said that by not imposing President’s rule in Gujarat in the wake of communal riots, the Vajpayee government had lost the moral right to invoke the Article 356 of the Constitution against any erring state government. Mr Manjeet Singh Dogra, ex-MLA, Nadaunta, today criticised the Himachal Pradesh Congress chief Ms Vidya Stokes for shielding anti-social elements. Mr Anand Sharma, spokesperson for the All-India Congress Committee, has criticised the Prime Minister, Mr Atal Behari Vajpayee, for his doublespeak” on the Gujarat carnage. Mr Maninder Singh Bitta, Chairman, All-India Anti-Terrorist Front, has demanded the expulsion of Mr Kapil Sibal, Congress spokesperson, for fighting the case of Devinder Pal Singh, a dreaded Punjab terrorist who had been awarded death sentence by the Supreme Court, and said the party would be held responsible, if the sentence of the criminal, convicted for killing scores of Congress workers, was diluted. The district headquarters town is stinking as garbage here has not been removed for the past three days. Heaps of filth are seen lying in various parts of the town and if no immediate steps are taken, the town may see the outbreak of a contagious disease. Dr S.D. Sharma, Vice-Chancellor of the Himachal Pradesh University, has underlined the need to involve every individual in environmental issues to protect the “humankind” from the fury of nature. The Himachal Pradesh Government will constitute a committee shortly under the chairmanship of the Chief Secretary to look into the demands of drivers and conductors. Two militants and their accomplice who were responsible for January 1 attack on Army men near Damtal were today remanded in 14-day police custody by the District and Sessions Judge, Kangra. In a minor bureaucratic reshuffle the Himachal Pradesh Government today transferred nine middle rung officers, including the Deputy Commissioner of Lahaul and Spiti district. Mr Dev Raj Sharma, member of the Himachal Pradesh Public Service Commission, will discharge the functions of the Chairman of the commission till further orders, according to a notification issued here today. The Himachal Pradesh Government will construct some shops, a rain shelter and toilets at the Bajjreshwari Ghat on the bank of the Banner khud near Purana Kangra on the Kangra-Hoshiarpur road to provide more facilities to people. The organising secretary of the district unit of the ABVP, Mr Parivesh, has demanded an inquiry into the allegations of financial irregularities at GGDSD College, Baijnath. Chaman Vatika School, Ambala, won the overall trophy in the debate competition organised to mark the 25th anniversary of Himalayan International School near here yesterday. Mr Ram Bilas Paswan, President, Lok Janshakti Party, has said that by not imposing President’s rule in Gujarat in the wake of communal riots, the Vajpayee government had lost the moral right to invoke the Article 356 of the Constitution against any erring state government. He maintained that imposition of President’s rule was essential to ensure a free and fair poll in the state and ensure that minorities participated in the election process without fear. Addressing a press conference here today he said the Centre should have dismissed the Modi government, particularly when the Prime Minister, Mr Atal Behari Vajpayee, himself felt that the unsavoury happenings in the state were a slur on the image of the country. However, instead of taking action, the BJP was glorifying Mr Narinder Modi, the defiant Chief Minister, who had the cheek to take out a “guarav” Yatra in the state. The partisan approach adopted by the NDA Government in dealing with the Gujarat Government had weakened it. It would not be able to invoke Article 356, if there was trouble in states like Jammu and Kashmir and Bihar. Referring to the economic slow down Mr Paswan said that the country had slipped from 116 to 124th position in the matter of development as per the latest report of the United Nations Development Council, which was a clear indication that the policy of economic liberalisation had proved counter-productive. He said he was not against liberalisation but disapproved of the policy of large-scale privatisation being pursued by the present government. During the past three years assets of public sector undertakings (PSU’s) worth over Rs 35,000 crore had been sold off. Worse the PSU’s which were earning profit had been privatised. These included Maruti Udyog and BALCO. A move was on the sell off the NALCO, a Navratan company on which to government invested Rs 4500 crore recently. All this had further squeezed the employment opportunities. The NDA Government had promised to create one crore jobs every year, but the Planning Commissions figures indicate the number of jobs had been curtailed by 20,000. The situation would further worsen if the government accepted the second report of the labour commission. It would allow a free hand to the employers for retrenching workers and they could resort to lockouts at will. The Vajpayee government was the most corrupt in the country since Independence. It had surpassed the Congress party’s 40 years record in just four years. There was hardly any department which had not been hit by a scandal. The sugar scandal, Ketan Parikh scam, Tehelka episode, petrol pump and land scams. He lambasted Ms Mayawati, the Uttar Pradesh Chief Minister, for joining hands with the communal forces and said his party would hold a rally in Delhi on September 27 for her removal. It would be followed by a Dhikkar rally at Lucknow on October 4. Mr Paswan said the track record of the Dhumal government in Himachal was no better. It had been vigorously pursuing its one-point agenda of political vendetta. The government had been working overtime to fabricate false cases against leaders like Mr Virbhadra Singh, a former Chief Minister, and Mr Sadanand Chauhan, a Lok Janshakti Party leader. Not only that atrocities on Dalits and other weaker sections had increased and farmers, fruit growers and employees were feeling cheated. It had woefully failed in securing state’s share in the BBMB projects and protecting the fragile hill environment for which the Supreme Court had slapped a fine of Rs 1 crore on it. The ruling BJP suffered a setback in Una district when Mr Sadhu Ram, a veteran Dalit leader and a former minister, deserted the party and joined the Lok Jan Shakti. He made an announcement to this effect here today in the presence of Mr Ram Bilas Paswan, who said the new entrant would be entrusted national responsibility in the party. Mr Sadhu Ram said he decided to quit the BJP because of rampant corruption in the Dhumal government and continued neglect of old and dedicated party workers. He said he had been in politics for the past over three decades, but still lived in small house, whereas those who became minister for the first time had amassed wealth running into crores of rupees. Talking to mediapersons here today, he said whatever transpired at Mehre on September 20 was the result of high-handedness on part of Ms Stokes who was ousting all loyalists from the party only to grab the power with the help of anti-social elements and added that he would take up the issue with Ms Sonia Gandhi. He said he was beaten up by the outsiders at the rally and also humiliated by senior party leaders. He said he was a loyalist of Mr Virbhadra Singh and would continue to remain so. He alleged that when he went to garland Ms Stokes on her arrival at Mahre along with hundreds of his supporters, some persons who were hired by Mr Rajendra Zar, general secretary of the state unit of the party, surrounded her and prevented others from meeting or garlanding her. Besides this, neither he nor his supporters were allowed to speak at the rally, he further alleged. Mr Dogra said if the party high command failed to give him patience hearings, he would let the issue be decided by the party workers of the area. Replying to a question, he said he had not received any show-cause notice from the party. Mr Dogra said he was not sure that he would get justice as he had appealed against the formation of the Nadunta block Congress Committee and the district Congress Committee. Mr Dogra clarified that the people were the real judge and they would decide the fate of all in the coming election. Meanwhile, the district Congress Committee today denied that Mr Dogra was beaten up by the loyalists of Ms Stokes at a rally in Mahre on September 20. Talking to mediapersons here today Mr Balak Ram Sharma and Mr Tej Nath, president and general secretary, respectively, of the local unit of the DCC, said Mr Dogra was trying to hide his faults by putting the entire blame on Stokes loyalists. In fact, he had brought musclemen from various parts of the district. However, when the people wanted to listen to Ms Stokes and other party leaders, Mr Dogra’s supporters could not disrupt the rally and were sidelined. Mr Rakesh Handa, senior vice-president of Hamirpur DCC, and Mr Sunil Sharma, Hamirpur DYC chief, were present at the press conference. Congress leaders said the party had already issued a show cause notice to Mr Dogra to explain his position with regard to the rally and if no satisfactory reply was given, he would be expelled from the party. Mr Anand Sharma, spokesperson for the All-India Congress Committee, has criticised the Prime Minister, Mr Atal Behari Vajpayee, for his doublespeak” on the Gujarat carnage. He said if the Prime Minister was serious about it he should take immediate notice of the vitriolic utterances of Mr Narender Modi, Chief Minister, against the minorities and perform his “raj dharma”. Talking to newsmen here today, he said Mr Modi’s action showed that he was furthering the hidden agenda of the Sangh Parivar and the BJP with the tacit approval of Mr Vajpayee the BJP leaders had perfected the art of double speak. He said the caretaker government had made things worse in the troubled state. It was neither accountable to the legislature nor responsible for its action. The Chief Minister had made a mockery of the Constitution. The remarks of Mr Modi against the minorities were not only inflammatory but also constituted cognisable offence, he said. He alleged that the state government had punished those officers who performed their duties during riots and gave correct information to the Central Election Commission. The officers guilty of dereliction of duty had been rewarded with plum postings. Such acts were undermining the confidence of the civil administration. Mr Sharma said the Supreme Court’s acceptance of the report of the Election Commission on the Gujarat situation, amounted to an indictment of the Modi government. The government had not challenged the report in the presidential reference. He claimed that the Congress would sweep the ensuing Assembly poll in Himachal Pradesh. The people were totally disillusioned with the Dhumal government, which had failed on all fronts and set a new record of corruption. Addressing a press conference here today he said he was the main target of the powerful bomb attack on the office of the youth Congress engineered by Devender Pal in which 35 innocent persons mostly Congress workers were killed. It was most shameful on the part of Mr Sibal to defend a convicted terrorist who massacred partymen. Inaction on the part of Congress high command had made Mr Sibal’s action suspect. He had written a letter to Mrs Sonia Gandhi, more than a month ago, but hadn’t had any response. Further, his security had been withdrawn, just before the blast in 1993 on the instruction of Mr S.B. Chavan, the then union Home Minister, though intelligence agencies had informed about the increased threat perception. Only recently, he received a call from Canada that some influential people had gained access within the Congress to eliminate him. The failure of the district administration to locate a site for dumping garbage has led to the present problem. The safai karamcharis of the town are finding it difficult to dump garbage as a result. Nearly five tonnes of garbage is collected from the town daily. The local civic body had earmarked nearly 28 sites in various parts of the town where garbage and other waste material is thrown. It is collected by the safai karamcharis later on for further dumping. The local civic body had failed to find a suitable site for this purpose after the district administration had stopped it from dumping garbage on the Hamirpur-Dharamsala road near Hotel Hamir. The administration took the step when residents of the local Housing Board Colony staged a dharna in protest and resorted to a road blockade 15 days ago. A team of the civic body had inspected many sites for choosing a dumping place but could not take a decision. The reason was that either all proposed sites were located near the localities or inside dense forests. The Department of Forests does not allow anyone to dump any thing in its areas to save ecology. A team of local reporters today visited various parts of the town and found garbage bins full. The worst scene was witnessed near the main bus stand. It was difficult to pass through the area and people had to cover their noses with handkerchiefs. Mr Raj Krishan Sharma, Executive Officer of the civic body, admitted that garbage was piled up at various places. He said it would be lifted but it was difficult to say where it would be dumped as people at all places were opposing the move. Meanwhile, the state government is upset over the failure of the local civic body to implement the Rs 50 lakh Solid Waste Development Programme for the town. This money is lying unutilised with the civic body for the past three years. People of the town have failed to mobilise public opinion to finalise a place for dumping garbage. Inaugurating a week-long training programme on “environmental economics” organised the Population Research Centre of the University he said the nature had never been revengeful but the indiscretions of the man had made it so. The only remedy to the increasing environmental problems was to create awareness and mobilise people to protect nature. He said that media and the non-government organisations could play vital role in educating masses on environmental hazards. He said that unfortunately the traditional approach to development did not take into account its impact on the environment. Of late the government and individuals have become more aware and informed on the fragile nature of our relationship with environment which was a good sign. There was need for taking action in the key areas of socio-economic growth with equity and conservation of natural resources and the environment, he added. The Programme Director Prof. J.P. Bhati said that 20 resource persons would share their experiences on the issue of environment management. He said that mediapersons and NGOs from Himachal, Punjab, Haryana, Chandigarh, Delhi, Rajasthan and Uttaranchal were participating in this programme. The Vice-Chancellor also inaugurated a refresher course in history. He said the scholars should periodically engage in the re-interpretation of historical events. Instead of isolating history as a discipline, historians should reach out to other social science disciplines and even use literature as a source of information and theoretical formulations. He regretted that due to growing commercialisation and decreasing job opportunities, the younger generation was loosing interest in the study of history. However history remained a subject of a great social significance and one that had great relevance in these fast changing times. He felt that historians needed to look at all different dimensions of history. The histories of sciences, environment and social thought were some of the aspects needed to be brought into focus. This was disclosed by Prof Prem Kumar Dhumal, Chief Minister, while he was addressing the annual meeting of the Drivers and Conductors Association at Didwin-Tikar in the district last evening. He said members of the association would also be included in the panel besides the Financial Secretary and officers. Mr Dhumal said the government would consider to grant uniform allowance to drivers and conductors of government and semi-government organisations as is being given to the others categories of employees. He said keeping in view the cooperative attitude of drivers who had called off strike the government would consider their demands sympathatically. The Chief Minister said the government would also consider relaxing the qualifications of the daily wage drivers and regularising their services, subject to fulfilment of other conditions. He claimed that the government had always adopted liberal attitude towards the demands of employees honestly. Mr I. D. Dhiman, Education Minister, said the district was now connected by two new national highways. Mr Man Chand, president of the State Drivers and Conductors’ Association, welcomed the Chief Minister and placed a demand charter before the Chief Minister. The Chief Minister assured him a sympathetic consideration. Mr Ved Prakash Bhatia, president of the Punjab State Drivers and Conductors’ Association, and Mr Rajinder Pal, president, HRTC, Drivers and Conductors Association, also addressed the meeting. Earlier, the Chief Minister also inaugurated two rooms of Government Senior Secondary School, Didwin-Tikar. Two militants and their accomplice who were responsible for January 1 attack on Army men near Damtal were today remanded in 14-day police custody by the District and Sessions Judge, Kangra. They were arrested by the Punjab police and then handed over to the Kangra police for further investigations. According to police sources, Abdul, alias Vijay and Abdul Rashid, two Kashmiri militants, and their accomplice, Makhan Din Gujjar, were today produced before the magistrate who remanded them. Abdul was arrested by the Punjab police on June 8 from Ludhiana. During investigation he confessed that he was responsible for various terrorist attacks and bomb blasts in Punjab and at Damtal in which four Army men had died. The attackers had entered the nearby Bhadroa forest and later escaped. Abdul named Abdul Rashid, Mohd. Islam and Jamaluddin as his other accomplices while Makhan Din Gujjar used to provide them shelter. The group was also involved in gun running in the border district of Gurdaspur. On information provided by Abdul, the Punjab police arrested Abdul Rashid from Jammu and Kashmir while Makhan Gujjar was rounded up from Hoshiarpur. The police had failed to arrest Mohd. Iqbal and Jamaluddin while the weapons reportedly buried in Chakki after Damtal attack had also not been recovered. Mr Subhashish Panda, Additional Deputy Commissioner, Kangra, will be the new Deputy Commissioner of Lahaul and Spiti. Mr C.R.B. Lalit has been posted as the settlement officer, Shimla and Kinnaur, at Shimla. He relieves Mr L.R. Mohit, of the additional charge. Mr Devesh Kumar, Additional Director of Industries, goes as the Additional Deputy Commissioner, Mandi, while Mr Pushpendra Rajput, Sub-Divisional Officer, Shimla (Rural) takes over as Additional Deputy Commissioner, Kaza. Mr Amandeep Garg, Sub-Divisional Officer (Civil), Dalhousie, has been posted as Additional Deputy Commissioner, Kangra. Mr Hira Singh Thakur, Regional Transport Officer, Mandi, takes over as Registrar, Dr Y.S. Parmar University of Horticulture and Forestry, Nauni, in place of Mr Hans Raj Sharma, who takes over as Joint Secretary (Revenue) and Mr P.N. Negi, Additional District Magistrate (Development) Kaza, has been posted as joint director, Food and Supplies, Himachal Pradesh, Shimla. Mr O.P. Kant, Deputy Director, Food and Supplies takes over as Sub-Divisional Officer, Shimla (Rural). 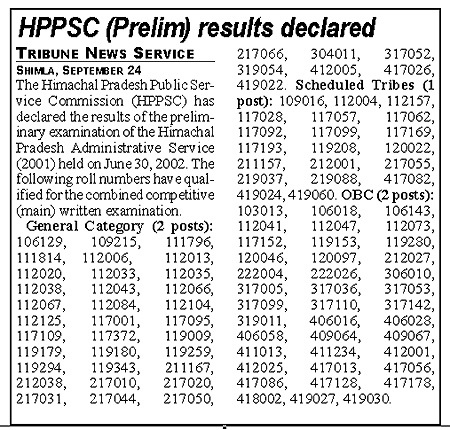 The Himachal Pradesh Government had also transferred eight DSPs. Mr Anupam Sharma, DSP, Rajgarh, takes over as DSP, Solan. Mr Madhu Sudan takes over as DSP, Shimla (City). Ms Ranjana Chauhan, DSP, Chamba, takes over as DSP, Rajgarh, and Mr Kishori Lal, DSP, India Reserve Battalion, Una, has been posted as DSP (Headquarters), Chamba. Ms Rani Bindu, DSP (Headquarters), Una, takes over as DSP, Bilaspur. Mr Madan Lal, has been transferred to the IRB, Una. Mr Arvind Negi, DSP, Shimla, takes over as DSP, (Leave Reserve) Manali, and Mr Ramesh Pathania takes over as DSP, Una. State Agriculture Minister Choudary Vidya Sagar said this while addressing a press conference here today. He said the Bajjreshwari temple would fund the expenditure. Besides this steps would be taken to beautify the ghat. He said the project would incur a cost of Rs 40 lakh and be completed in three phases. In the first nearly Rs 13 lakh was spent on the project. Mr Vidya Sagar, who took a bath along with party workers at the Bajjreshwari Ghat, alleged that the former MLA of Kangra, Mr Dhaulat Choudary, was levelling baseless charges against him to gain public attention. He said Rs 4 crore was spent in this Assembly segment for the construction of school and mahila mandal buildings and panchayat bhavans. He claimed that development works were in full swing in Lunj, Loohi and Jogipur panchayats of this constituency. In a statement issued here today, Mr Parivesh said the financial and administrative mismanagement had affected the college atmosphere. The ABVP leader alleged that students had paid more than Rs 180,000 last year for the installation of a water cooler for having clean drinking water, but the authorities have not purchased one so far. The UGC had given funds to the college authorities for the construction of a hostel but, a school was being run in the building while the students were being denied the facility of a hostel. As many 10 prestigious schools of northern India, including Doon Cambridge (Dehra Dun), Pinegrove (Kasauli), Bishop Cotton (Shimla) and St Bedes College (Shimla), participated in the debate competition. Trishanjali Sharma of Chaman Vatika School was adjudged the best speaker. The Director-General of the Himachal police, gave away the prizes.